EADS Astrium has signed an agreement to acquire Guildford, United Kingdom–based Surrey Satellite Technology Limited (SSTL) from the University of Surrey. 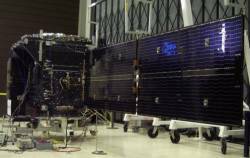 SSTL designed and built the first Galileo In-Orbit Validation Element (GIOVE-A), the only European GNSS satellite currently on orbit. The company also is building a second GIOVE-A spacecraft under contract to the European Space Agency (ESA). EADS Astrium, a leading European satellite manufacturer with more than 12,000 employees and a wholly owned subsidiary of the European Aerospace and Defence Systems company, numbers about 2,500 people in its UK operations. SSTL is joining EADS Astrium following a decision by the University of Surrey to sell its majority stake of about 80 percent in the small satellite manufacturer. SSTL will remain an independent UK company with its individual brand after completion of the deal, which is subject to obtaining the relevant regulatory approval. Under the share purchase agreement, valued at between £40–50 million (US$80–100 million according to one news report), SSTL will be owned by EADS Astrium NV in the Netherlands. In the financial year ended July 31 2006, generated £471,692 profit (before tax) on £21 million (US$42 million) turnover. The purchase agreement also anticipates a long-term research collaboration between the University of Surrey and EADS Astrium that will allow Astrium to benefit from staff training and development opportunities afforded by the links with the University. Reportedly, SSTL had been approached by — and rebuffed offers from — Germany’s OHB Technology and Thales Alenia Space, which are expected to compete with EADS Astrium for ESA contracts to develop Galileo’s space segment. Last December, OHB and SSTL announced an agreement to work together on the Galileo program, with OHB acting as prime contractor and supplier of the satellite platforms and SSTL as the navigation payload manufacturer.